The trend of modern electrical work is in the direction of high potentials. It has been only a few years since a potential of 2,000 volts was considered unusually high, but at the present time we are using pressures as high as 110,000 volts, while that of 60,000 volts is not at all uncommon. This is largely due to the locating of power plants at great distances from the district of distribution, requiring consequently high-potential transmission. The author has also treated to a considerable extent of high-frequency currents, in order that the reader may not only have a clearer conception of its use in wireless telegraphy, telephony and electrotherapy, but also that he may more fully understand the peculiar surges produced on long transmission lines by lightning. 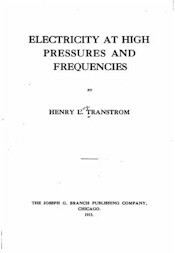 While the author does not believe that the use of high-frequency currents will supersede those of lower frequencies, yet such currents should be understood even in practical work. With high-frequency currents transmission becomes difficult, owing to the enormous inductive reactance and capacity effects. which makes transmission over long distances impossible. Although currents of almost inappreciable quantity can he transmitted by means of electromagnetic waves, the current so transmitted is not sufficient for any practical use, notwithstanding popular opinion to the contrary. This work is necessarily a brief treatise only of some of the principles and wonders of high-frequency currents at high and other potentials, owing to the limited space and the high technical knowledge required to completely fathom the problems of this as yet new field.